Murukku was part of our Sankranti festive food preparations this year. 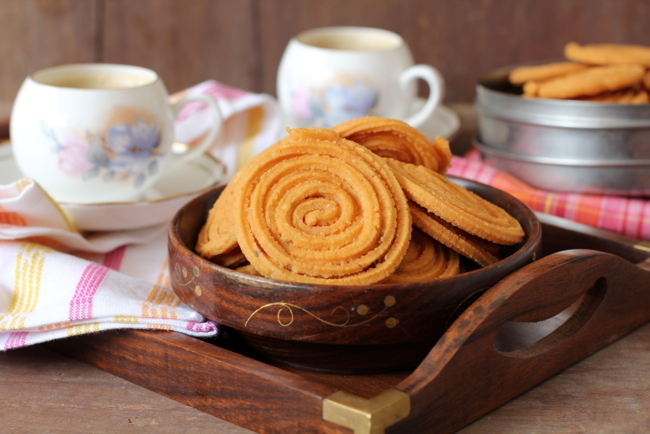 Murukku, also known as Chakli, Murukulu and Jantikalu, is a favorite savory snack in our home. 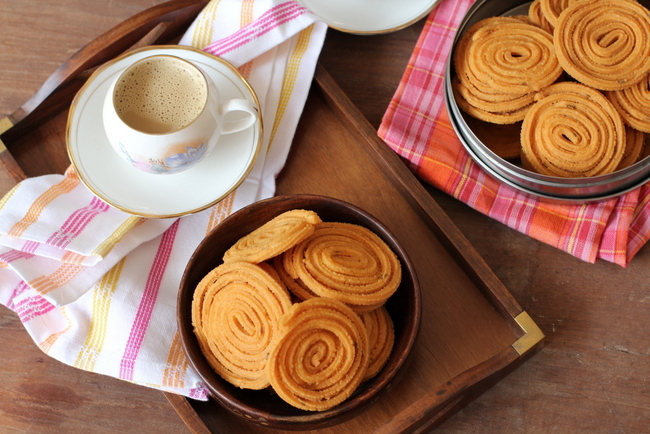 A traditional and classic snack that is crunchy and addictive with a cup of coffee or masala chai. Perfect to serve guests and works great as an after school Indian snack for kids. You can never stop with one or two of these gluten free delights. There are a few variations to the Murukku recipe that has rice flour as its key ingredient. Either urad dal flour, chickpeas flour or roasted chickpeas flour goes in and adds color and flavor along with cumin or carom seeds or sesame seeds. You have unlimited variations in flavor or shapes to chose from and as a newbie you will need a little practice to make the concentric circles. A janthikalu press with a single star shaped disc is essential to prepare this culinary gem among South Indian recipes. Heat 2 cups water and a tsp of salt in a stainless steel vessel. Bring to a boil and reduce flame. Slowly add the rice flour and mix to form a gooey paste. Place lid and keep aside to cool. Once the rice flour paste cools, add roasted chickpeas powder, cumin seeds, red chili powder, asafoetida powder and melted butter. Mix well to make a smooth dough. If required add a little more rice flour to form a smooth dough. Alternately, if you feel that the dough needs some water to form a dough, sprinkle some warm water and mix to form a smooth dough. Ensure that the dough is not too soft or hard, It should be just right to come through the press to form murukkus. Heat oil for deep frying in a heavy bottomed vessel. While the oil is heating prepare the murukkus for deep frying. Place a single star shaped disc in the murukku press, grease the insides of the mold, fill the mold with some of the prepared dough and make concentric shaped murukkus on a wax paper/greased banana leaf or a greased plastic sheet. This helps to easily transfer them into the hot oil. Prepare 6 to 7 for each batch based on how large the vessel is for deep frying. To test if the oil is hot enough for deep frying, drop a small ball of the dough into the oil. If it sinks to the bottom of the vessel with a sizzle and come right up. The temperature of the oil is right for deep frying. Reduce flame to medium and place 5 to 6 of the prepared murukkus and deep fry to a golden brown shade. Do not deep fry on high flame. Remove onto absorbent paper. Once cool, store in air tight container. To prepare rice flour at home. Soak 3 to 4 cups rice in water for 4 hours. Drain water and wash thoroughly. Drain water completely and spread on a thin cloth or paper. Dry overnight indoors. Next day grind the dried rice to a fine powder. Sieve to make a fine powder. Store in an air tight container upto 2 months. Ensure that the dough is not too soft or hard, It should be just right to come through the press to form murukkus. Always keep the unused dough covered while the rest of the murukkus are cooking. While one batch of murukku is frying, start pressing the concentric circles/murukkus for the next batch to be fried. Do not prepare all the murukkus at once as they will dry out. Do not fret too much if the murukku breaks while pressing into concentric circles. With practice, you should be able to make perfectly shaped murukkus. By Sailu Published: January 20, 2013 Murukku, an evening snack recipe made with rice flour and roasted chickpeas flour. 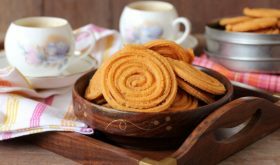 Addictive South Indian snack that goes well with a cup of tea or coffee. God, I was dreaming of these a few days back. Will be trying it out! I am planning to make some snacks as I am expecting visitors this week end. Murukku is perfect. Lovely pictures and well explained cooking method. Thanks. O dont have the disc, is there no other way than janthikalu press? It can be done by hand but needs a lot of practice. what is chickpea powder? is it available in d market?can we make it at home?if yes,HOW? Roasted chickpeas are available in the market. Grind them to make a fine powder. If you do not have roasted chickpeas on hand, you can substitute it with besan (chana dal powder). Hi Sailu! I am a big follower of your blog and have tried many recipes successfully in the past. Never gave any feedback even though they all deserve one. After trying the Murukus, I thought I had to let you know how appreciative I am for your recipes. They came out so well, my kids thought they were store bought as I always do because I never had the guts to try such snacks. This recipe with simple ingredients and straight forward directions convinced me to give it a try and it was HUGE success! A big thank you from all of us in our family!! Can I soak the rice for more than 4 hours? Will this affect the texture of Murukku? Yes, you can. It should not affect the texture of Murukku. Murukku looks perfect. Will it change the proportions a lot if I use store bought rice flour? My food processor may not yield as fine a flour as store bought. I am afraid it will alter the texture, ruin the recipe. I wished I could pluck one from that beautiful bowl- chala nachindhi. Aa bowl set ekkada konnaru? I love your tea cup and saucer set. They are lovely, are they available only in India or can we procure them in the U.S. as well? Thank you for the wonderful recipes and great pictures. Cups and saucer is always lovely. I got six sets from a website. Originally they are from UK. I had to spend closely US Dollars 100 for the six sets. Only, they are usually 4 ounce size. The design is aristocratic with gold rim and pastel floral design. I can send you a link and also picture of the cup and saucer. All my family and visitors appreciate the beauty of these classic china ware. Thank you. This set is a gift and am not sure where they were bought. do we have to roast the chickpeas 1st & then make powder & then measure it? I am trying Murukku. for the first time but it got spread in the oil while frying. My oil has become complete mess up . Please help me to solve my problem to make good Murukku. can we use urid flour instead of besan/dhalia ? I’ve tried with dhalia but it comes out very hard. I was using 2:1 but looks like its got to be 4:1. would that make a difference?